At a time when retro is in, Dale Earnhardt and Richard Childress Racing will go back in time and return to the 1980s for the 1999 Winston all-star event on Saturday night, May 22 at Lowe's Motor Speedway in Charlotte. Earnhardt will pilot his GM Goodwrench Service Plus Chevrolet in the all-star event, but he won't be 'The Man in Black' on this night. Instead, his car will feature the nostalgic blue and yellow colors with Wrangler Jeans on the hood. It has been 11 years since Wrangler Jeans was associated with the No. 3 car of Richard Childress Racing. After winning the 1987 NASCAR Winston Cup championship together, Wrangler exited the sport and GM Goodwrench advanced from its associate sponsorship to RCR's primary sponsor. The entire gang is back together for this one race. "It's great to see those yellow and blue colors again," said team owner Childress. "Looking at the car brings back a lot of memories. GM Goodwrench Service Plus and Wrangler have been instrumental in RCR's success. I'm glad we could bring them together for this reunion." For the driver who spent seven years driving a Wrangler car and another 12 years in a black GM Goodwrench car, the 1999 Winston will be memorable. "This paint scheme is pretty special," said Earnhardt. "It represents the two major sponsors I have had throughout my racing career. We were fortunate to represent both GM Goodwrench Service Plus and Wrangler Jeans as champions. It will be great to get them into Victory Lane again." "This is the fifth paint scheme that GM Goodwrench Service Plus has had for NASCAR's all-star event," said Bill Fitzgerald, event manager at GM's Service Parts Operations. "The Winston is an exciting and entertaining event for GM Goodwrench Service Plus. Dale's 'pass in the grass' while driving the Wrangler car brought the all-star event into prime time." "The yellow and blue No. 3 brings out an enormous sense of pride for all of the people associated with Wrangler Jeans and Shirts," said Brian Goldberg, vice president of marketing communications for Wrangler. 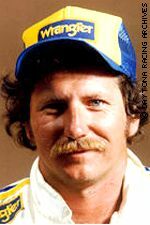 "We can't help but feel a bit nostalgic for the old days when Dale Earnhardt was just beginning to make a name for himself, and the sight of the Wrangler Jean Machine in Victory Lane was a familiar sight. The years 1981 and 1987 bookmark Wrangler's racing roots with a whole lot of action including two championships."